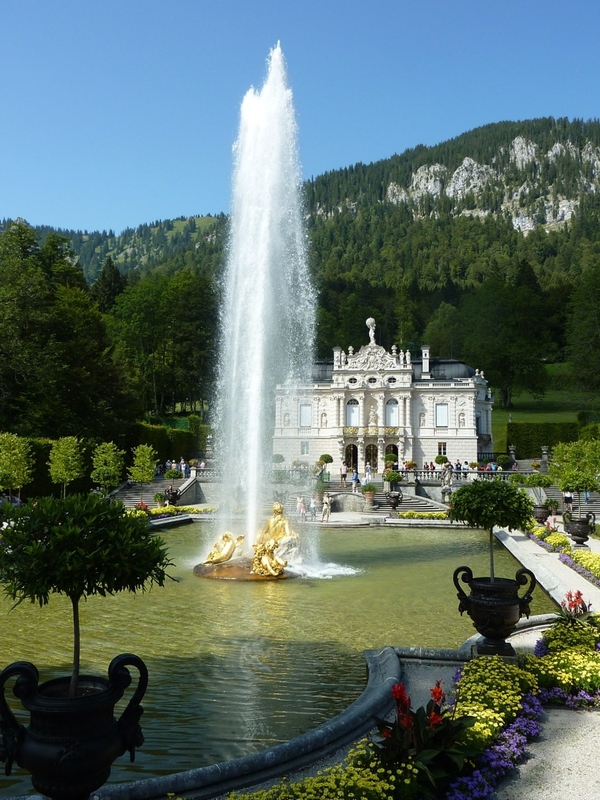 Schloss Linderhof was one of the building projects of King Ludwig II of Bavaria. 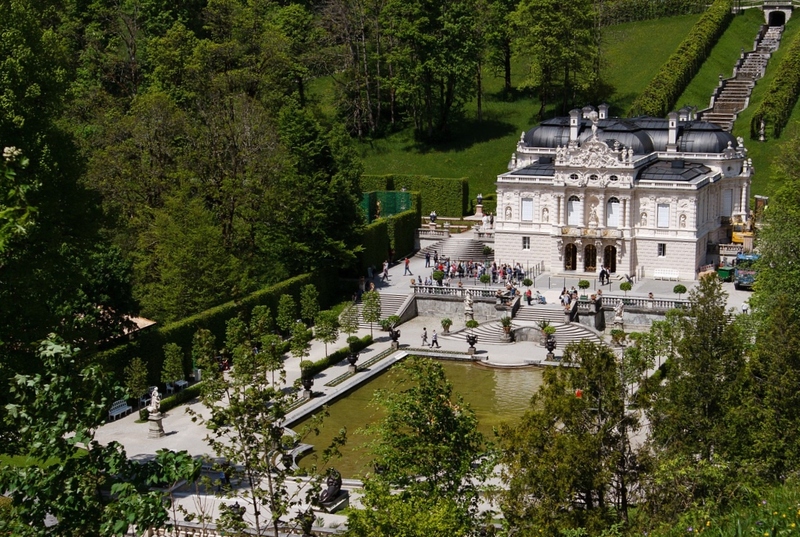 It was once build as a hunting villa by Ludwig’s father, Maximillian II. It was the only building that was finished during Ludwig lifetime. The architect was georg dolman who was also involved in building Schloss Neuschwanstein. The wooden hunting lodge was taken down and rebuild nearby in the park. On the spot the new palace rose, named after a lime tree that is still there in the gardens today. The little Rococo Linderhof palace, although one of the smaller german palaces, is just as pretty and fabulous as the Neuschwanstein palace. The inexhaustible fantasy of the king is visible in every aspect of the palace and gardens surrounding it. All rooms are elaborately decorated and filled with beautiful paintings and sculptures. 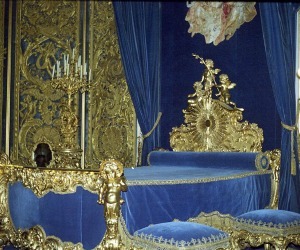 You can also see paintings and statues of the French kings Louis XIV and Louis XV of whom Ludwig was a great admirer. Also Queen Marie Antoinette was one of his favorites. There are only a few more important rooms in the palace which measures 30 x 27 meters. The bed chamber is the main room in the u shaped palace. 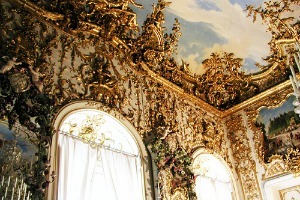 From his blue velvet bed the king could glaze at the ceiling which is covered in paintings and ornaments. On the same floor are the dining room and the audience chamber and some smaller rooms which had no real function. King Ludwig added some modern novelties in this palace too (like he did in Neuschwanstein). The oval dining room had a table that could be lowered into the floor. The set table could come up and the King and his company could enjoy the meal without having servants in the room. Although the King usualy dined alone the table always had to be set for 4. it was said he preferred to dine with his imaginary guests, such as Louis XIV the Sun king and Marie Antoinette. 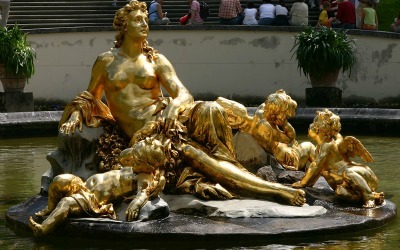 When you approach the castle the first you will see is the 30 meters high Fountain with a gold plated flora figure. Especially in the gardens you can witness the efforts the King took to create a dream world. 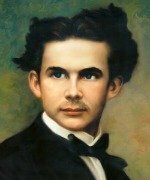 One of the first electricity projects in Bavaria was the Venus grotto, an artificial cave that was inspired by Wagner's opera Tannhäuser. The king could float around in a swan shaped boat or a silver plated shell, listening to the waterfalls and an orchestra playing Wagner. 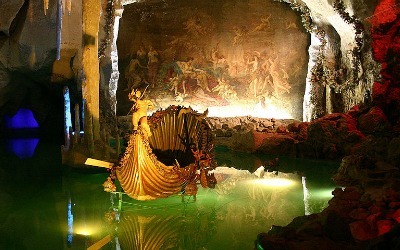 The electric lights illuminated the grotto in changing colors, making mysterious shadows on the walls. He could escape from the real world for hours there. Other highlights of the garden are the old hunting lodge from Ludwig’s father, the Venus Temple, the Moroccan House and the Moorish Kiosk. The last two buildings are evidence for Ludwig’s other fascination in addition to opera; Orientalism.